Deadites Online is the official fan’s source for Evil Dead. We are dedicated to bringing you the fans the latest news, information, and media on Sam Raimi’s Evil Dead films. Deadites Online was established in the summer of 1997 by Kain as a small fan site originally called Ash’s Evil Dead Page. 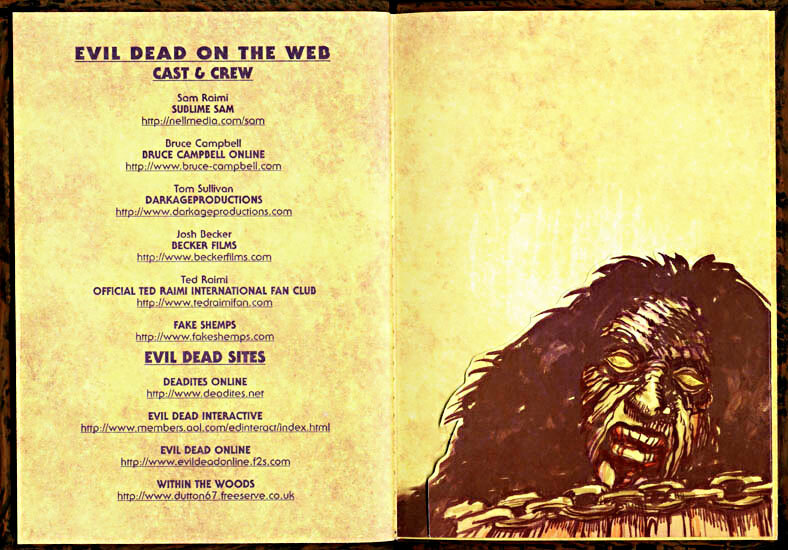 Ash’s Evil Dead Page was inspired by Paul Petzrick’s Evil Dead Interactive and other Evil Dead fan sites at the time. The site featured information and screen shots from the films. Ash’s Evil Dead Page eventually evolved into a full fledged news and resource site with the re-releases of the Evil Dead films on VHS and DVD by companies such as Elite Entertainment and Anchor Bay Entertainment. By chance Ash’s Evil Dead Page was contacted by Tom Sullivan, special f/x makeup genius and illustrator for the first Evil Dead film, who offered to give us an exclusive interview. The famous interview conducted by our own Cliff Holverson. The interview was later referenced in Bill Warren’s The Evil Dead Companion book. The popularity of the Evil Dead increased dramatically over the next few years with multiple video releases of the Evil Dead movies plus licensed merchandise such as t-shirts, action figures, and video games. Deadites Online grew bigger and added more content. As the site grew, a worldwide online community of fans sprung from the site. Kain decided to change Ash’s Evil Dead Page to Deadites Online to better fit the world community of Evil Dead fans. Deadites Online gained notoriety by making it onto Anchor Bay Entertainment’s The Evil Dead Book of the Dead Limited Edition DVD and interviewed for New York Times.